Ok, so I lied to you guys. I’m not actually in Paris yet. I planned my trip so that I would be able to visit my friends before my program started because mine starts pretty late, the 10th of September actually. And let’s be honest, my parents were itching for me to leave anyways. So, I am in the little town of Anthy-sur-Leman, right next to a larger town called Thonon-les-bains, which is about 40 mins East of Geneva, so that’s where I flew first. The town is right at the bottom of the French-Swiss alps and situated on a large lake. Thonon is the sister city of Mercer Island and I first came in contact with my friends through the sister city organization of Mercer Island when I was a junior in high school. Signing up for the exchange that year was one of the best decisions I ever made. When I was 17, I arranged a two-week homestay with a girl I had never met, Roxane Camail, and little did I know I would become great friends with her and her family, and have this place to stay and visit whenever I wanted. Sidenote: when I was 17, I had been learning French for only three years, and I had yet to have a real French teacher in high school. While I may have felt like a confident French-speaking teenager, as soon as I arrived here, I quickly realized, I knew next to nothing. The first day I was here, (jet-lagged as I was) all I could muster was “ok” and “oui.” I think I cried that first day and emailed my parents saying, “What have I done? !” The next few days, I got my bearings, and quickly fell in love with this place and the people. And now I am back. I know I have improved much since the last time I was here. Instead of sitting in silence during long conversations, I try and interject with a story or anecdote when I think I can explain myself the best with the littlest amount of embarrassment. It’s still a work in progress, I have a lot of French expressions and vocabulary that I just don’t know. But, c’est la vie! I have four more months here, I’m not too worried about improving, it just happens naturally. As soon as I start dreaming in French (within the next day or two, I swear), I’ll know I’m getting there. 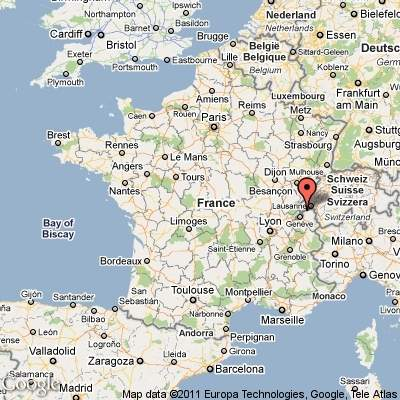 Thonon (map included) is part of the Haute-savoie region of France, famous for their cheeses. Tres arromatique, those cheeses. Some of them I do not have the taste for but there are many local dishes that use the cheese and other foods of the region. They eat a lot of fish because they are so near to water and many other typical French foods as well. I’m sad to say the weather is ridiculously depressing and abnormal. How did I possibly leave Seattle to plus 70s and come here to find just rain and wind? It’s limiting the things we’ll be doing this week but my hosts, Claire and Roxane, both 19 and about to be college sophomores, are happy to find things for us to do that bend to the drastic weather changes. Yesterday was my first full day and yes, it was raining the whole day. We packed a lunch and drove to the Chablais region of Switzerland and went to le Bains de Lavey – these large outdoor pools and rooms with steam and saunas. Nevermind the rain, the view was breathtaking. The baths are situated in between these giant mountain ranges, some still with snow on them. Unfortunately, low, grey clouds rolled in with the rain and the mountains disappeared. Then, last night, I had my first real legal drinking experience. The town is quite small and suburban, so I was actually surprised to hear there was a local “boite” or club. So I guess I shouldn’t have been surprised to see that the age range was about 17-50+. Yikes. But regardless, it was fun. As for the rest of the week, who knows. The rain will most likely dictate our activities, but I’m glad to be here, relaxing and practicing my French before the Parisians dismiss my attempts and immediately start speaking in English to me.